Our "Pastel Sparkle Collection" is available in pink, light blue, light yellow, lavender and mint - all are pure beeswax. For a softer hint of color we offer our "Sheer Sparkle Collection." These are available in the following colors: white, pink, light blue, light yellow, lavender and mint. Please note that these are not pure beeswax, but the sheer effect is beautiful. We now have a variety of "Jewel Tones" and "Decorator Colors." Look for pictures on our site soon! And, yes, you can burn them!!! 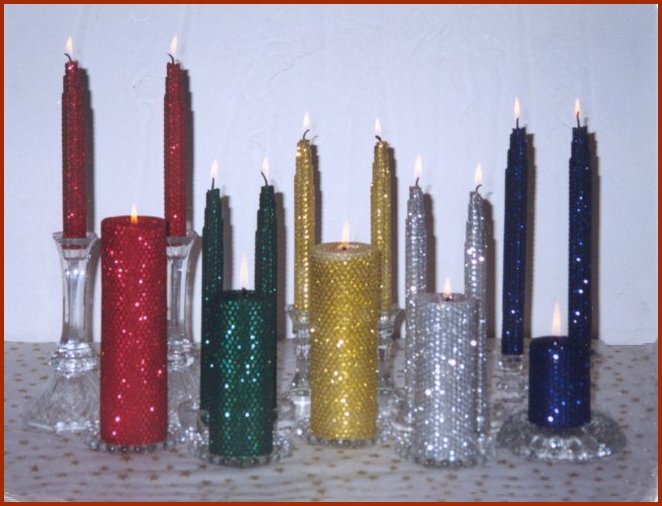 Our "Holiday Sparkle Collection" consists of pure beeswax candles in red, green, burgundy, cobalt, purple and black. We also offer silver, gold and white, which are made from a blend of waxes. While all of these colors are great for the Holidays, many people use these colors throughout the year. 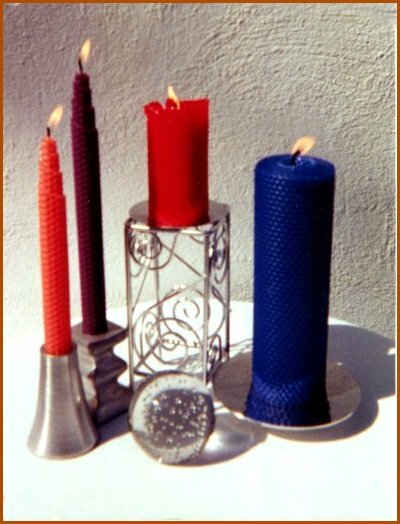 Beeswax candles look great in any decor. Available Colors -- Actual swatches coming soon!! !